The bright blue sky has been transformed to usher in another blanket of beautiful snow! It is a NEW day, another opportunity to count our many blessings! however she is still beautiful! and though she isn't at her best today...it is just for a season! Are you experiencing a season in life and you feel less than your best? Are times tough and your heart heavy? "Cast all your cares on Him, because He cares for you." And even though times are tough, you will want to feel the cool breeze as you run forward with all your heart! Please comment so I'll know you visited and I'd be honored to have you follow...hope to see you again soon! Aw, Cindy! Your post does my heart good. We have a bird feeder and bath in our backyard, and we also have two Cardinal couples. We call the larger of the couples the old couple, and the smaller the young couple. I love how protective the mails are of the females. They fuss at them if they get too close to the obnoxious bluejay! We are under ice here in Central Alabama. Our girls are out of school (as they were yesterday). We do not have equipment to handle any snow or ice here. I think Birmingham has only one snow plow! Stay warm! Thank you for stopping by my blog and entering my giveaway, also for putting me in your side bar. I'm glad you found me. Your little bird pictures are adorable and that little puppy oh my!! What is the breed of your dog, oh so adorable.. Thank you again for stopping by. Good luck in the giveaway. Beautiful and encouraging post Cindy - you captured some very beautiful pictures! Love the one with your dog - almost camoflauged! What a beautiful and up lifting post... I just loved all of your pictures with the snow and those beautiful birds, and that puppy.... OMG soooooo cute!!! Cindy, this was truly lovely. Every word and every picture were perfect. Thank you for sharing, and it makes me realize again how much God loves us all. Those birds are just precious, and little snow dog is the cutest thing going! Such a beautiful word of encouragement and hope. You have such lovely birds at your feeder, beautiful! Beautiful pictures and uplifting words! Love the birds. Such beautiful pictures. Thank you for sharing such a lovely post. What a sweet post and little bit could get lost in that snow if you aren't careful. Have a great one. THose are fantastic pictures. Really pretty! Hi Cindy! It's so funny that we both posted cardinal photos - they look almost exactly the same! I love taking photos of the yard birds, too. I especially love Ellie Mae's snow pic - so cute! What a beautiful inspiring post.The cardinals are gorgeous! I saw a male cardinal just the other day in our yard. I thought they migrated to like Arizona or someplace warm. Surprise! What a beautiful and inspiring post. You have definitely made my day. Gorgeous pictures. Beautiful uplifting post! I love the cardinal shots too. 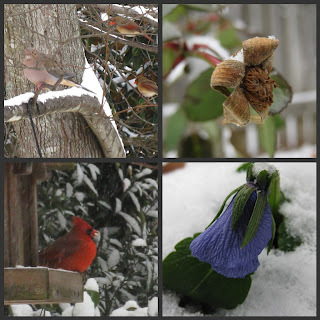 What fantastic pics you took of those sweet birds in the snow! great job! We had 5-6 inches of snow last night and i had to drive thru it since hospitals don't close but at least the roads were good this morning coming home from work!! have a great day!! Such beautiful photographs! Thank you so much for sharing them with us. So, so good to read this today and your photos are wonderful. Is that your puppy?? Too cute! Wonderful post Cindy! We were just talking to our son about God knowing the number of hairs on his head (which he thought was pretty funny) and how if He provides for the birds then can't we trust Him to provide and care for us? I need to be reminded of that myself so many times and I appreciate you bringing this truth to life with your gorgeous photos and inspiring words. Thanks so much for sharing it at Inspiration Friday! What a beautiful post. Your photos are amazing! Loved all the Cardinal shots as they are my favorite bird and I find the Mrs. every bit as gorgeous as the Mr. Very nice posting! I am a fan of cardinals also and love how you captured them in your images. Thanks for sharing! Your post is beautiful, I love the Cardinals in the snow. They are so pretty. You have some great yardbirds. I enjoyed your photos. Beautiful post and lovely photos.